Car Detailing- What is it? Do automatic car washes damage your cars paint and cause swirls? What Is The Best Car Wax? What is the very best lambswool wash mitt for cars? Worx HydroShot Review- The Best Portable Electric Pressure Washer? GameSir G4S Review- The best Android and Windows Controller? What is the best 4k HDMI 2.0 Cable? What is the best hard drive enclosure? What are the rarest Amiibo? In 1996 Nintendo released the Nintendo 64 in Japan and shortly after launch Mario Kart 64 was released on the console. What followed was an evolution and improvement on the original Super Mario Kart that appeared on the SNES. Now, twenty years later Nintendo have released Mario Kart 64 on the Virtual Console for Wii U in Europe. The question is though, does it still play as well now as it did back then? The main game mode is Mario GP which consists of 4 different cups and in each of them there are 4 tracks to race on. So far, so Mario Kart. Also, since it is Mario Kart, there are of course different diffulty levels and in MK64 this is categorised into speed classes which are 50, 100 and 150cc. There is also the Mirror Mode which basically flips the tracks round the other way and this tasty mode is your prize for getting Gold Cups in 150cc mode. In terms of controls, the game still holds up really well when played on the Wii U gamepad. Granted, the control stick on the Nintendo 64 looks and feels different from the Wii U equivalent but this despite this it didn’t make the game feel unwieldy or uncontrollable at any time. Thankfully, the mini boost feature that was introduced in Mario Kart 64 is still easy enough to pull off using the Wii U Gamepad, which is a great relief since getting the best time attack times is dependent on being able to pull off this manoeuvre properly. Whilst the game is notorious for its rubber banding AI, it is still a joy to play and at no point did I feel that I was going to turn off the Wii U in a fit of rage for just losing out in the top spot in a race. In the 150cc and Mirror modes the real challenge really kicks in and there were many times that I felt I had just secured the win by the skin of my teeth. The other single player mode is Time Trials, and as the name suggest, you’ve got to get the quickest time going around the track. There is no one else on the track at the time, just you. Back in the Nintendo 64 days, it supported a feature that incorporated the Controller Pak. This was the ghost feature and it would save your fastest time. The benefit of this is that you could race against your ghost to try and beat it as well as being able to take your controller pak over to a friends house and let them try and beat your time. Sadly, due to the way the Controller Pak worked, Nintendo haven’t been able to emulate it in this release so the ghost function is now no longer available. You are of course still able to play the Time Trial mode and it’ll save your best times, just not a ghostly second racer of your best time. For many, Time Trials added a whole new level of gameplay into Mario Kart 64. In the UK at least, this was spurred on by N64 and their ‘I’m the Best’ feature where players could send in their best times to win gaming related prizes/rubbish. 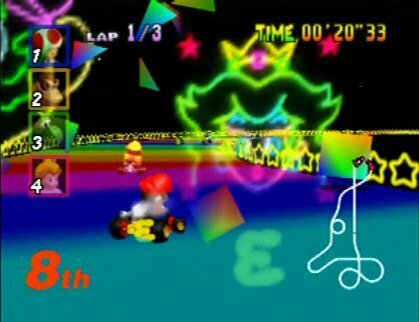 Rainbow Road is still very much a love/hate course for many Mario Kart fans! One of the biggest draws for many people after playing Super Mario Kart was the ability to play the game with three friends. 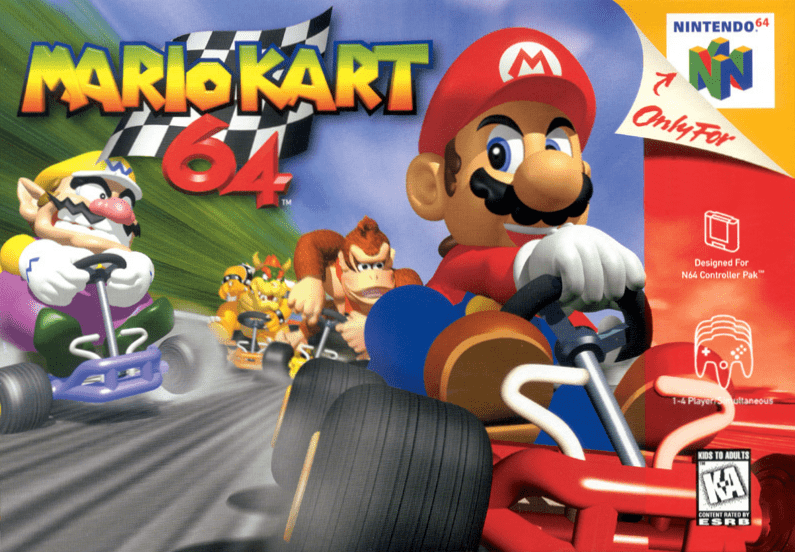 From the start Nintendo had intended the Nintendo 64 to be an experience for single and multiple players and Mario Kart 64 was a great way to introduce the world to the amazing carnage that is 4 player Mario Kart. Not only could two people play their way through the Mario Grand Prix mode, but you could race three other people on any course to claim victory. In terms of multiplayer modes though, the one that has really stood the test of time is Battle Mode. In Battle Mode, every player starts the match with 3 balloon with the object of the match being to pop your opponents balloons. This can be done by hitting them so fast that they skid, launching a weapon into them or (depending on the course you’re playing) knock them off of the course. The Skyscrapper map in particular was pretty difficult to master but as mentioned above, the spot on controls make this map a beast to play. In the more recent Mario Kart games the Battle Mode has been lacklustre at best so it’s been a welcome treat to go back and play arguably the best Battle Mode in the entire Mario Kart series. In terms of how well the game plays on the Wii U, you would never know there was any emulation going on (except when you being up the Virtual Console menu) since it plays exactly like it did on the Nintendo 64 hardware. As with other Virtual Console games, it can be played in its entirety on the gamepad as well as allowing you to customise the controls in any way in which you desire. The game has basically been left untouched and yes, you’re still able to do that epic cheat of skipping out a large portion of Rainbow Road as soon as you start the race. Graphically the game still looks great today which is no mean feat when you consider that it came out so early in the lifespan of the Nintendo 64. The courses are in 3D with the models being sprite based, and yet they look 3D which was surely a way of Nintendo getting the most out of the game on relatively new hardware and still make it run smoothly. The music is still as memorable as ever, too and after a few races I was humming along the track songs after I had put down the gamepad for a break. As with other Virtual Console releases, there will be black bars down either side of the screen. Having said that, the picture quality on the Wii U when playing on a 50 inch TV is a lot better than playing the Nintendo 64 version on the same TV. Of course, this is in part thanks to the HDMI connection on the Wii U that improves the quality as much as possible when compared to the composite output on the Nintendo 64. Mario Kart 64 really was an evolution for the franchise with its 4 way multiplayer, the jump to 3D and of course the birth of the Blue Shell that would home in on the person in first place. It is still a joy to play to this day and it deserves a space on your Wii U beside the mighty Mario Kart 8. If you don’t have Mario Kart 8, you can get it from here in the UK and here in the USA. For those that would like to give the gift of Mario Kart 64 to a Wii U owner, you can do so by buying an eShop gift card from Amazon UK and Amazon USA. The Review Space Copyright © 2019.